- NEW! Clock scene with sparkling time and date. Great all year round! - The ability to choose any combination of your favourite scenes above for rotation. - A range of vibrant colour schemes, with a beautiful colour cycling mode that sweeps through all the colours of the rainbow. - Gorgeous glowing background light or flare spotlight with shimmering sunbeams. - Choose your favourite camera angles and 3D animation fly-bys. - Snowfall amount and speed. - HD options to increase display quality. Great for tablets! - Lots of performance options to help run smoothly and save battery power. - 32-bit colour mode for smoother colours. - Option to count down in either rounded-up days (the traditional days-to-Christmas method), or a fully accurate and nail-biting Days, Hours, Minutes and Seconds method. - New interior tree camera angle. - White sky option for Snow scene. 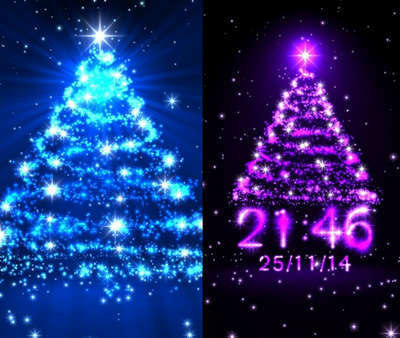 Do you want more live wallpapers for this Christmas, check out the links above the screenshot!